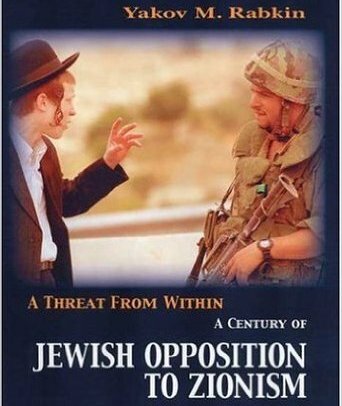 Two years ago, Professor Yakov Rabkin of the University of Montreal published a landmark study on Orhtodox Jewish opposition to Zionism, entitled "A Threat From Within: Jewish Opposition to Zionism." The book originally appeared in French as "Au nom de la Torah. Une histoire de l'opposition juive au sionisme." The book is available for purchase from Palgrave Macmillan, linked to the English bookstore on our website. For our readers' interest, we now present a review of the book published on Counterpunch by a well-known commentator on the Israeli-Palestinian conflict, Michael Neumann. Neumann's views are not necessarily those of our organization. However, his review sheds light on the importance and relevance of religiously motivated opposition to Zionism, as well as the differences between it and secular anti-Zionism. "Professor Yakov Rabkin offers us an unusual book. It is not history, because it does not present a narrative of Jewish opposition to Zionism, nor a systematic analysis of its causes and development. It is not polemic--though Rabkin's sympathies are clear, he presents the arguments of others far more than his own. It has too much anecdote and too many vignettes to count as philosophy; it is too philosophical to count as politics or sociology. "Jewish Opposition to Zionism not only defies categorization; it also belies its title--at least for most of us. There have been other books, collections of essays, on Jewish opposition to Zionism. They contain essays by such 'modern', secular Jews as Norman Finkelstein, Uri Avnery, Norton Mezvinsky, Israel Shahak, perhaps early works by Martin Buber or Alfred Lilienthal. Often as not they argue the cause of the Palestinians and appeal to such standards as international law, or the Geneva Convention, or the UN's Universal Declaration of Human Rights. "None of this will be found in Rabkin's work, yet his title is appropriate. Rabkin brings us into the world of the anti-Zionist orthodox, for whom Zionism is the antithesis of Judaism and the destroyer of everything properly speaking Jewish. This may seem like an irrelevance today, or at least as a topic of very limited interest. By Rabkin's own account, the numbers of these orthodox anti-Zionists are small, and their influence has declined steadily over the last century. To many they are a lunatic fringe; to most they are a force with little political future. But Rabkin teaches us about realities we could never understand without his help. He deepens--that's utterly accurate here--our understanding of Zionism and Judaism; he reveals what the former has done to the latter; and in the end his message could not be more contemporary or more relevant to the present conflicts in the Middle East. "I had, when I was young, some religious instruction in Judaism--in a conservative, not a reform temple school. I grew up among Jews whose piety varied from, well, none, to extreme. I came away with a general picture of Judaism and Jewishness we all shared. God had promised Israel to us. Our people had been exiled for various sins--God seemed kind of picky about worshiping idols and such. Then we endured a series of catastrophes and evils, from the destruction of the temple to the medieval persecutions to the pogroms of Eastern Europe. These were dwarfed by a horror such as no other people had suffered--what I knew as Hitler's Final Solution and what today get the pseudo-Biblical tag, The Holocaust. Yet the Jewish people arose from these ashes to found Israel, a refuge, a defense and, frankly, an instrument of vengeance against past and present enemies. We fought and fight for justice, for others as well as ourselves; we take pride in our strength; we stand on guard against the greatest evils, the evils of racial hate. We are reborn. "One could quite easily pass from this to quite strong opposition to Israeli policies without altering the narrative substantially. Israel's cruelties 'betrayed' our fine ideals, 'made a mockery' out of the traditional Jewish love of justice. Jews, who had suffered so much, should understand the suffering of the Palestinians--not to mention that we should also stop inflicting it. And the growing number of Jews who stand up to protest Israeli crimes testify to the persistence and renascence of true Jewish ideals. Against the false 'beacon of democracy' that is Israel, its Jewish critics hold up the true light of justice and compassion. "Rabkin not only destroys this narrative; he shames those who subscribe to it. His attack departs from what may seem an unpromising bit of theology. God--he reports the orthodox account--did not give the land of Israel to any race or 'people' in our sense of these words. He gave it to those who obeyed him, who lived by the Torah and His commandments, and only so long as they did so. In this sense alone did He give it to the Jews. And God was no mere stickler for what we may think of as the trivialities of ritual. 'His' people had sinned deeply, and for their sins they were in exile. To undo this exile was to compound the sin. No greater defiance of God and corruption of Jewish religion was conceivable. The Jews would return to Israel if and when they returned to God's ways, not before. Those who came back under the power of the gun--no matter how religious--were no Jews at all, but apostates and enemies of God. And this is why Zionism, which preaches redemption without repentance, and which trusts in armies and nation-states rather than God, is the enemy and destroyer of Judaism, of the Jews. Israelis have been known to revel in their pride, even their arrogance. Orthodox Jews preach humility and see strength, not in tanks or missiles, but in the very demanding, very difficult business of accepting suffering and God's will. "At first glance, secular readers may find all this unconvincing and unenlightening. Real Jews follow God; they don't sin--this seems quaint. That the Final Solution was a punishment for sin seems positively offensive. And what sort of world do we live in? The sort that can be illuminated by some strait-laced, moralistic theology from a distant past? "Yet one needn't embrace the theology to find in it a revelation. Judaism and Jewishness, it seems, need not be an exercise in unending self-congratulation and competitive victimhood. It need not be a racial creed either; the 'chosen people' are not chosen in virtue of birth or blood or kinship. In fact they are not really 'chosen' at all--God is not their spouse or sugardaddy but their ex: the divorce was the fault of the Jews themselves, and remarriage is a possibility but it will take some very serious, very costly effort. There is a message here even for those Jews who no longer worship any God. "'The Judaeo-Christian tradition' turns out to be no empty phrase. It refers, at least in part, to a morality that can survive apart from religious faith. Like Christianity, 'true Torah Judaism' sees pride not as a virtue but as a cardinal sin. More important, the orthodox creed insists that Jews have not inherited some moral carte blanche from their sufferings. They should not advertise their victimhood or promote themselves. Instead of trumpeting 'their' achievements--as if the accomplishments of brilliant Jews were some badge of racial superiority--they should take responsibility for their misdeeds. They should seek, not power, but to live peaceably with others, not in 'their own state' (the orthodox view states and peoples with just suspicion) but in whatever state they find themselves to be. In other words much of what is labeled 'antisemitic' by Zionists today--the denial of the specialness of the Jewish people or of any sense of entitlement proceeding from their sufferings--becomes, in the light of orthodox critiques of Zionism, something much closer to ordinary morality. "There is much else in Rabkin's book--priceless anecdotes, suppressed history, ruthless analytical critique and a valuable portrait of what real religion should look like. There are even important reminders of some very basic, all-too-contemporary facts. One hears, for example, that orthodox Jews in Israel are exempt from army service and subsidized in various ways. One might suppose that this is simply an Israeli tribute to piety--far from it. The subsidies and exemptions enjoyed by orthodox Jews are part of a compromise that reconciles them to cooperation with the Zionists, a movement they generally abhor: support for their religious life and exemption from defending Israel are the price the orthodox exact for limited cooperation with an enterprize they reject. Rabkin asserts that most orthodox Jews in Israel do not recognize Israel's right to exist. If this were more widely understood, it would be much harder for secular American Zionist Jews to condemn this position as antisemitic and cognate with Islamic fundamentalism. "Rarely does a work on what may seem an esoteric subject offer such urgently important insights. I doubt anyone can read this book without coming out much the wiser for it, and in many different ways." Michael Neumann is a professor of philosophy at Trent University in Ontario, Canada. Professor Neumann's views are not to be taken as those of his university. His book What's Left: Radical Politics and the Radical Psyche has just been republished by Broadview Press. He contributed the essay, "What is Anti-Semitism", to CounterPunch's book, The Politics of Anti-Semitism. His latest book is The Case Against Israel. He can be reached at: mneumann@trentu.ca.